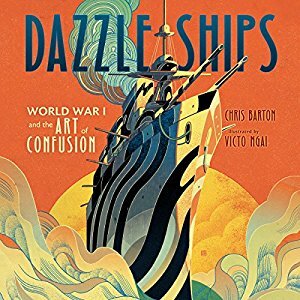 There is much to be learned from a well-crafted picture book whether or not there is a child available to help with interpretation. The collection for this week’s New Stuff Tuesday offers many lessons, all in time for fishing season. 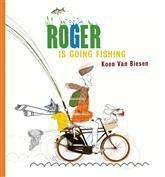 If it is, instead, the the power of fishing to inspire as it did Lieutenant-commander Wilkinson, then check out Roger is Going Fishing by Koen Van Biesen, translated from Dutch by Laura Watkinson. In this zany read-aloud, Emily and her neighbor Roger head off on Roger’s bike for an afternoon of fishing. The city sidewalk is so crowded that Emily inadvertently catches one person’s belonging after another, until quite the crowd is in the chase to the lake. Instead of flaring hot tempers because of Emily’s mishaps, all make the best of a good splash on a hot day, unlikely friends are made, and festivities ensue. In another fishing-inspired new addition to the Curriculum Collection, The Fishing Lesson, Heinrich Böll spins a fine allegorical yarn. A camera-toting tourist offers entrepreneurial advice to a fisherman. On each page, the tourist advises yet one more thing the fisherman could do to grow his business bigger and bigger until it would be what he believes to be a successful fish empire – only to find that the fisherman has a somewhat different idea of what success looks like. If you lack the gear, don’t care for the inevitable deer flies, and can’t stand the thought of hooking a leech, these stories will illustrate a modicum of the benefits that the fine pastime of fishing offers. This entry was posted in new stuff tuesdays, summer reading. Bookmark the permalink.